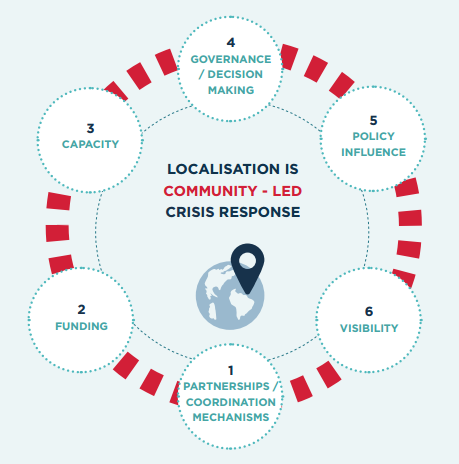 The term localisation is most often used (in the language of the Grand Bargain and Charter for Change, as examples of the most prominent policy-level discussions) to refer to processes that will solve existing problems such as the inefficient use of resources and centralised decision-making that make responses less effective. While there are many interpretations of how to deliver localisation, there is less clarity on what it is that we want to see as a result. Without this definitive end-state, we must recognise that there are many different possibilities. For the Start Network, at its most ambitious, the end goal is humanitarian response that is community led. We believe that there is a shifting scale of community-led responses, which depends on several factors: community access to local governance structures, relationships with local NGOs, existing conflict dynamics within communities, the important role played by international NGOs in certain contexts and so on. However, we have identified pathways that will deliver a shift towards a situation where decisions and responses are made closer to the community. This section outlines what we are currently doing towards localisation, where we have reached and what we intend to deliver in 2017 (and looking ahead). The figure alongside presents the pathways that we believe will move us closer to our ambition of community-led humanitarian response. The Start Network develops partnerships and facilitates coordination mechanisms (such as national decision-making groups, multi-stakeholder partnerships, national and regional consortia) to devolve decision-making, build capacity and help create sustainable change. The Start Network is an aggregator of services and funds. 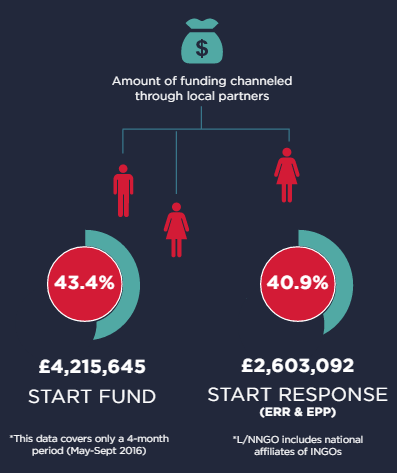 It helps deliver funding to minimise the number of intermediaries so that local organisations receive a greater proportion of financial resources. We currently gather data that demonstrates how much money we deliver to L/NNGOs (for example, 43.4% of funds disbursed for the four-month period from May to September 2016 were delivered to L/NNGOs). The primary Start Network governance body, the Assembly, now has 23.8% representation of L/NNGOs. This is a significant rise from just a year ago where only 15.8% of Assembly members were L/NNGOs. We believe that devolved decision-making is key to shifting the stewardship and governance not just of funds but of decisions about the focus of programmes and the direction of the Start Network (see snapshot ‘Localising decisions for more targeted, relevant response’). We are gradually making progress in this area but we want to do much more in 2017. The Start Network has supported L/NNGOs, where necessary, to influence national, regional and international humanitarian policy. This includes contributing to the Inter-Agency Standing Committee (IASC), the primary mechanism for inter-agency coordination of humanitarian assistance, along with participating in more conceptual discussions like those around the Grand Bargain. Through the DEPP, Start Fund and Start Response the Start Network has helped set up consortia, platforms and coordination mechanisms to consolidate and amplify L/NNGO voices, building and enhancing their influencing skills and advocating with national governments to support their involvement in policy and humanitarian practice. The work of the Start Network can only be achieved in partnership and collaboration with L/NNGOs. We believe that the Start Network and its numerous local and national partners contribute collectively to change. We have taken some small steps to creating a space where our local and national partners can represent themselves.